Tagged kids these days, shave and a haircut, that's a good look for him, you're hired! 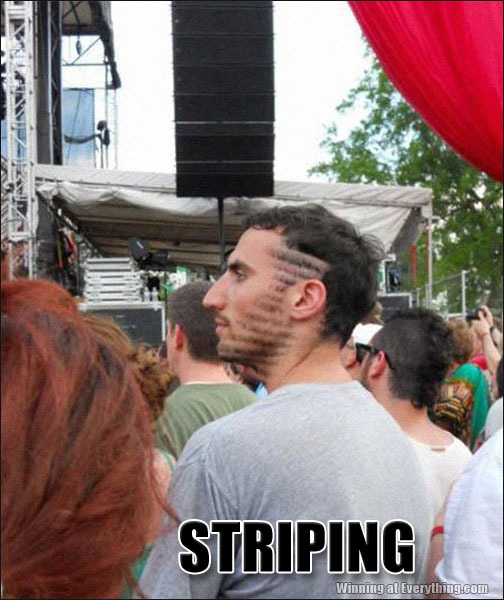 Did he fall asleep on a floor grate? Have you heard about Corduroy pillowcases? I’m outta here, remember to tip your waitresses! Iry the veal! PLEASE ADJUST THE HORIZONTAL CONTROL ON YOUR FACE. I agree. The look would be much more effective if he had made the lines parallel with his eyeline. I LIKE it… that he’s smart enough to get something that he can change tomorrow if he changes his mind!